I finally finished block #12 of Village of Hawk Run Hollow!! 40 ct. Sand Dune, NPI and Vikki Clayton Silks. I'm working my way up from the bottom. I'll work on block #6 next. Amy wanted me to put out a reminder about the Pals retreat in Myrtle Beach in October. I'm looking forward to going for my third time. We always have a blast!! Congrats! It looks so pretty and actually making me to feel like to start the autumn project now :) I saw about your retreat thing at Amy's earlier today. I'm sure you will have a lot of fun together!! Congrats on your finish, it looks gorgeous. Is it a large design? it looks big! Woo Hoo! Your block looks great!! Congrats on both of your finishes! I love VoHRH and hope to get it stitched...one day! Also, "Home of the Free" is just delightful. Such a wonderful design. That one's a doozy, isn't it? All that black! It's wonderful -- congrats on getting it all done! Yeah, congrats on getting her done Nicole. Your block finish is beautiful. I have Autumn HRH but haven't had the time or the courage to start it yet! That is looking lovely Nicole. Makes me want to grab CHRH and get started but maybe I will start it in January and have the goal of one block a month. Congrats on this pretty block!!! Woo-hoo!! I also have to pay my registration for PALS... Will be before you know it and I can't wait!! Very nice! Your colors are really pretty - so vibrant! What's coming up next? I'm so looking forward to SATB - only my second time. Very nice Nicole... you are rolling on your WIPS! Never stitched any of the Hawk Run series, but when I see how great they look, I want to! Very nice stitches. I really like your blocks. You did a nice job on both of them. Yeaaaaah. Your block looks fabulous!! There are certainly a lot of stitches in that one! It's looking great. #12 is the one with the black background isn't it? That's a lot of stitching. Congrats on finishing it. Congrats Nicole! It's beautifull. I make now the Christmas pattern. Having finished this block myself...I know the agony :) Just kidding...it is seriously gorgeous! Good going you! I'm sure you have a blast in Myrtle Beach, if it were just a bit closer....I'd be there in a snap! Congratulations, Nicole! I've finished Block 12, except for the black fill-in, which I will do a little of here-and-there. I am currently struggling with Block 6, not sure why, it just seems endless to me. I have some time off from work this weekend and another week in July, I'm going to just make myself finsh it! Good luck, let me know if you think Block 6 is slow going! Congrats on finishing block 12. Very nice! Very pretty!!! And that's the hardes block on the piece. Congrats on the finish!! Whoohoo!! It looks great!! Sooo cute! Nice to see you posting again! Congratulations, this is such a fun block! Congrats on finishing that block!! Very nice! Beautiful finish on this block!! I am thinking of stitching the grist mill as a special block for us as we spent out honeymoon at Stone Mountain park and loved the grist mill. 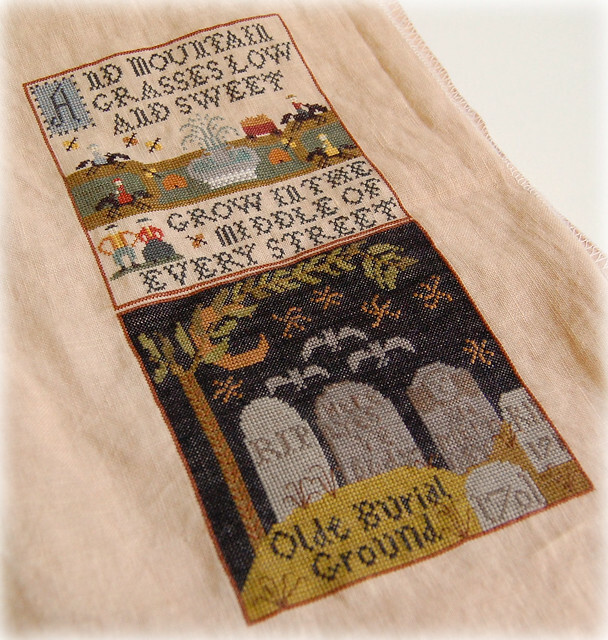 I would also love to do this total sampler one day too. I love the colors so much in it!! !